is focused on Opinion, Informative/Explanatory, and Narrative writing genres as required by Common Core and state standards. encompasses 36 weeks of comprehensive lesson-plans and classroom PowerPoints for each grade. contains everything you need to successfully teach writing, including scope & sequence, lesson plans, classroom PowerPoints, writing prompts, organizers, lessons, worksheets, assessments, rubrics, and writing samples. requires 30-45 minutes of instruction per day. includes classroom modeling and training videos with Online subscription. WHAT IS INCLUDED WITH THE ELEMENTARY SCHOOL CURRICULUM? Spiraled scope and sequence for each grade to organize the school year. Developed over a five-year period based on teacher and student input at a Title 1 school. Structured, but allows for creativity and differentiation. Step-by-step lesson plans for 36 weeks with tons of ideas and tips to keep students motivated and enjoying the writing process. Scripts are included for those teachers who are new to teaching. PowerPoint presentations that coincide with the 36 weeks of lessons. Over 30 slides in each week’s lesson with over 1,000 slides in all per grade. Makes teaching easy and includes writing samples. Use with electronic white boards or any type of computer display. Grade level appropriate writing prompts covering Opinion, Informative/Explanatory and Narrative writing genres with related word banks that teachers can use in modeling. 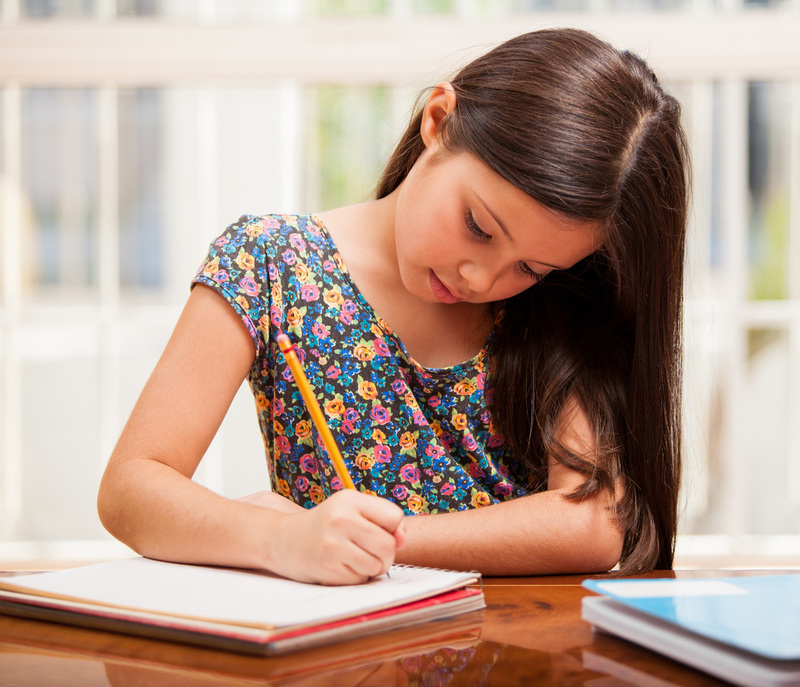 Text-response writing exercises target Common Core and state benchmarks, and book suggestions help to blend in reading instruction. Graphic organizers with graduating difficulty that can be used for an entire year. These help students begin the writing process and structure their writing. Only 2 types of organizers are used throughout the program so that the entire school is on the same page. Daily “Write Aerobics” exercises to help students brainstorm and organize ideas. Daily “Mini Lessons” to perfect the writer’s craft, covering organization, vocabulary, grammar, punctuation, sentence fluency, and voice. Grade level appropriate new words and transition words. A color coding system that promotes structured, coherent essays with supporting statements, transitions, beginnings, and endings. Students love this system and it only requires 8 color pencils or crayons. Editing sheets for teaching students to edit their work. Writing samples to be used for modeling (teachers love these). Online subscriptions for teachers come with access to training and modeling videos. 10-WEEK JUMP-START PROGRAM. For students who cannot write a quality 5-paragraph essay. Contains everything you need including a scope & sequence, and lesson plans for 10 weeks of expository writing instruction. 16 COMPREHENSIVE GENRES OF WRITING. Teaches informative, summary, autobiography/biography, cause-effect, problem-solution, argumentative/persuasive, response to literature, compare-contrast, descriptive, autobiographical narrative, narrative, letter, how-to, research paper, oral presentation, and content area writing. 75 MINI-LESSONS WITH EXERCISES TO PERFECT THE WRITER’S CRAFT. Lessons and exercises to help students improve ideas, organization, voice, word choice, sentence fluency, and conventions. WHAT IS INCLUDED WITH THE MIDDLE SCHOOL AND HIGH SCHOOL CURRICULUM? A 10-week intervention program that teaches students to write coherent 5-paragraph essays with descriptive language and smooth transitions. Spiraled scope and sequence and step-by-step lesson plans for 10 weeks of expository writing with tons of ideas and tips to keep students motivated. Writing prompts and graphic organizers with related word banks that teachers can use in modeling. Daily mini lessons to teach organization, vocabulary, grammar, punctuation, sentence fluency, and voice. A color-coded system that promotes structured, coherent essays with supporting statements, transitions, beginnings, and endings. Covers 16 genres of writing and over 40 weeks of instruction: 1) Informative; 2) Summary; 3) Autobiography/Biography; 4) Cause-Effect; 5) Problem-Solution; 6) Argumentative/Persuasive; 7) Response to Literature; 8) Compare-Contrast; 9) Descriptive; 10) Autobiographical Narrative; 11) Narrative; 12) Letters; 13) How-To; 14) Research Paper; 15) Oral Presentation; and 16) Content Area Writing. Contains everything you need to teach these 16 genres, including scope & sequence, lecture notes, writing prompts, graphic organizers, assessments, rubrics, sample essays, and writing exercises. Meets Common Core and state benchmarks. Includes 75 mini-lessons to help students improve their craft. Contains tons of fun and engaging exercises. Organized based on the 6 traits of exceptional writing: 1) Ideas; 2) Organization; 3) Voice; 4) Word Choice; 5) Sentence Fluency; and 6) Conventions.